Building scenery to surround your HO scale model train layout is half the fun of model railroading. Scenic backgrounds are a creative challenge and many different materials are available to make the scenery look realistic to proper scale. Browse through model railroading supply catalogs to find ideas for creating a realistic mountain view. Do research on your layout’s geographical location. If your layout is for a Santa Fe line, and you want to replicate the run from Santa Fe, New Mexico, to Phoenix, Arizona, for example, look at color photographs of the topography for the area. Note mountain structures and the types and colors of rocks found in these ranges. The best scenic layouts are keyed to real geographical surroundings. Map out the base of your mountain on your train layout board using a grease pencil. 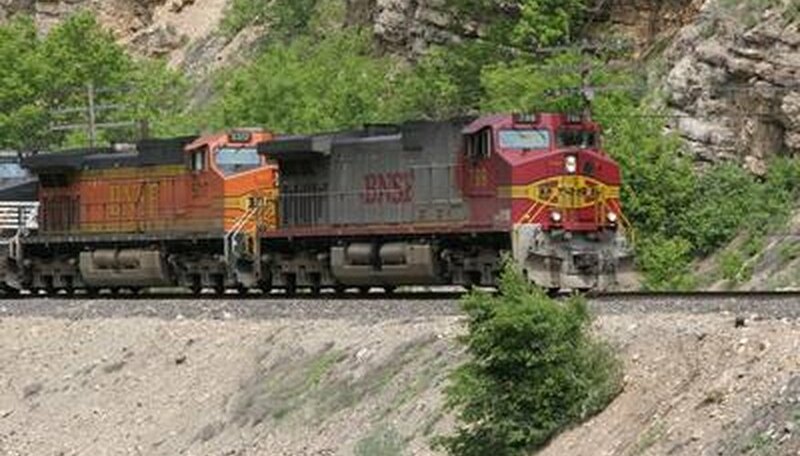 Locate the mountain base 2 or 3 inches away from any established tracks going by the proposed mountain: few railroads would lay tracks directly next to a mountain side due to the danger of rock slides. Create many tight balls of newspaper by wadding it up in your hands into fist-sized balls. Close the newspaper balls with a little adhesive or masking tape so they will keep their shape. Lay them inside the mountain shape. Stack them up to the proper height for your mountain. Press them flatter in some areas to form mesas, or press them into sharp folds to create valleys. Use more tape to keep this final mountain shape in place. Cut many strips of plaster-impregnated bandages into 12-inch long sections. Dip a bandage into a bowl of warm water. Wring the excess water out of the bandage. Pull the crumpled bandage apart and spread it flat over the top of the newspaper balls. Apply many strips of plaster bandages over the entire mountain shape until the newspaper balls are completely covered with plaster bandages. Let dry overnight. Mix a 1/2 gallon container of fast-setting dental plaster or Hydrocal to the proper formula with water. Hyrdocal sets very quickly, so don’t make more plaster than you can apply in a few minutes. Spread Hydrocal over the hardened plaster bandages using a flexible plastic putty knife. Work quickly. Cover the entire mountain with Hyrdocal. Experiment with different finish textures, from very rough to smooth. Let dry overnight. Glue any pre-manufactured HO scale boulders, stones, or viaduct pieces to your mountain. Use adhesive to set these pieces in place. Base paint the entire mountain according to the proper color scheme for the location. Use a water-based scenic paint or latex paint that is thinned with water until it creates a stain. If your location is New Mexico, base the mountain with a brick red colored stain. Use two or more colors of full-strength scenic paint to create additional depth of color on the mountain landscape, applying it on top of the base paint in select areas. Give the mountain even more sculptural definition by mixing a thinned dark brown or black paint and rubbing it into the creases, folds or other surfaces of the mountain. Sprinkle HO scale pre-manufactured rubble, talus rocks and other debris where such rocks and rock falls might be found at the base of a mountain or the end of gullies. Glue this talus to the layout so it won’t shift and interfere with the rail tracks. Make sure the color of the talus matches the color of your mountain rocks. Paint in any large areas of green grass with an opaque paint: blend two or three colors of green for more realism. You can also create more realistic grassy areas by sifting HO scale “grass” over areas coated with spray adhesive. Use a salt shaker to sift the grass material over the damp adhesive areas. Place pre-made HO scale model trees and scrubs on the mountain side if they are appropriate for the geography. Use adhesive to fix the trees to the mountain base. Don’t use more than two or three species of trees on your mountain: most mountain ecosystems support only a few types of trees. Mix conifers with deciduous trees with restraint. Add any HO scale buildings to the mountain to suit your scenario. The most convincing structures will make sense in terms of location on the mountain. If you want to run a tunnel through your mountain, you will need to build or use a tunnel form that you lay inside the newspaper balls before applying the plaster bandages and Hydrocal. Plan ahead: lay tracks inside these tunnels before proceeding because it will be too late once the mountain is built. Be extra smart by creating an easy access panel on the backside of the mountain so you can access the inside of the tunnel in case of derailments.